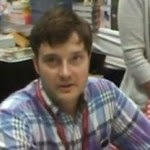 On Saturday, July 26, while the rest of the cast were signing autographs in the Warner Brothers booth in the Exhibition Hall at Comic Con 2014, Michael McMillian was seen at Chronicle Books (Booth #1506) signing his book, "Steve Newlin's Field Guide to Vampires." I stopped by to see just what was going on in his area and to say "Hi!" and shot this short video below.